I saw The Theory of Everything shortly after I underwent an unplanned coronary bypass operation. For the first time in my life, I understood experientially what it means not to have control over one’s body. I felt completely vulnerable and the experience evoked much introspection. It, therefore, was not difficult for me to relate to the catastrophe that takes over the life of Stephen Hawking, a Cambridge Physics student who suddenly discovers he has a motor-neuron disease, which is known today as ALS. It is a progressive disease in which one loses all physical control of one’s body. Only the brain is still functional. The narrative begins at Cambridge where Stephen meets Jane Wilde, a literature student. In addition to being physically attracted to one another, they have a strong intellectual compatibility and soon fall in love. When Stephen discovers his motor-neuron disease, Jane does not abandon him; instead she decides to marry him and be a source of love and support through his difficult medical journey. Stephen continues at college and receives his doctorate in physics. He shows great promise in the world of academia, but as his illness progresses his relationship with his wife is strained. Amazingly, they have three children in spite of Stephen’s physical challenges and his marriage miraculously survives for a number of years. To manage her stressful life at home, Jane joins the church choir, which for her is a natural extension of her faith. Her religious sensibility is something which Stephen does not share; being the detached scientist, he can only relate to that which is objectively verifiable. As the disease worsens, technology comes to the rescue, enabling Stephen to talk through a computer with a built-in voice synthesizer. He becomes deeply engaged in his work and less engaged with his wife, who is finding life with Stephen difficult and stressful. Eventually, they divorce amicably as Stephen’s academic career blossoms allowing him to be productive intellectually in spite of his debilitating physical state. Later on when they visit the Queen of England for an important personal audience with Her Majesty, Stephen asks his former wife and his children to accompany him. He smiles broadly at his children and says to Jane, “Look what we made.” Stephen understands that his greatest and most satisfying legacy is not his scientific publication but rather his children. They are the legacy that matters. The first commandment in the Bible is to be fruitful and multiply. Having children creates a legacy. According to Jewish law, this commandment is fulfilled when one has a son and a daughter. Rabbi Mordechai Becher insightfully observes: “having children also helps the individual achieve his purpose in creation, by improving his character. Nurturing, caring for and educating children encourages the development of sympathy, mercy, and sensitivity to others.” Having kids compels one to think of others, and not be totally absorbed by one’s own needs. Moreover, Jewish tradition mentions ways people can have “children” even if they physically cannot produce children. If one is not blessed with the ability to have kids, then a legacy of good deeds can resonate into the future. If one is a teacher, one can raise many disciples because students are viewed as one’s children. When a teacher passes along wisdom to subsequent generations, he is leaving a legacy of wisdom for his students and the children of his students. 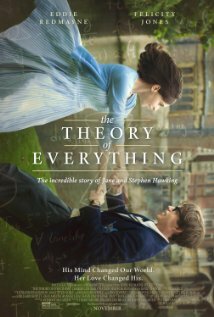 The Theory of Everything reminds us that Hawking’s greatest gift to the world may not be his scientific theory, but his children who are the living embodiment of his thoughts and his hopes for the future. The insights and wisdom he imparts to them in the crucible of daily life find expression in the words and personalities of his children who live after him. Purchase a copy of this movie from Amazon.com. Posted in Drama, Movie review, Romance. Bookmark the permalink.